Amy Knickerbocker has been with Allaby & Brewbaker since May of 1997. She previously worked in the Personal Lines Department as a Customer Service Representative. In 2008 she earned her Property & Casualty Agents License and in 2009 her Life and Health License. 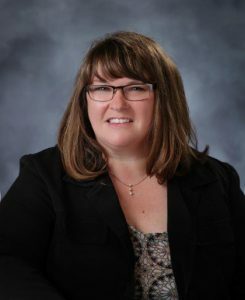 A graduate of Lansing Community College, Amy has worked in the insurance field most of her life including some time with an independent claims adjusting firm and an insurance restoration company. Amy is a graduate of Ovid – Elsie High, and still resides in that area with her husband of 17 years and two teenage sons. Her hobbies include following the Detroit Tigers, cooking, movies, crafts, and watching her boys compete in one of their many sporting activities.